Like I said with my previous post about the service, I had another appointment with Dermclinic and this time it was a full leg treatment. I was honestly excited, I mean for a woman like me - who does not want hairless legs unless I want to walk around like a Orangutan with shorts. I failed a few times to get it started because I did not prep my skin the right way. In all my stupidity, I decided to totally omit using lotion so as to make sure that the treatment would not harm my skin - so that decision was totally wrong since one requirement prior to a Laser hair removal is to make sure that the yet to be treated area should have enough moisture to sustain the treatment or have the risk of getting burned. I was advised to make sure to use lotion but stay away from anything that is whitening or has a strong scent. I did as I was told, then I did not shave my legs for 7 days and finally I was ready for the treatment. The first step was done by nurse Carla D. this time, since my first nurse Carla P. was in another appointment. My legs were shaved and then covered with silicone gel (which mind you, is cold) to protect your skin from possible burning of the IPL machine. Same precautions were given, that I may feel a little plain and also to let her know if I do. I was given protective goggles to cover my eyes with and she started on one area on the side of my leg and I felt absolutely no pain at all. With a larger area to treat, you can expect it to take longer versus the underarm treatment. 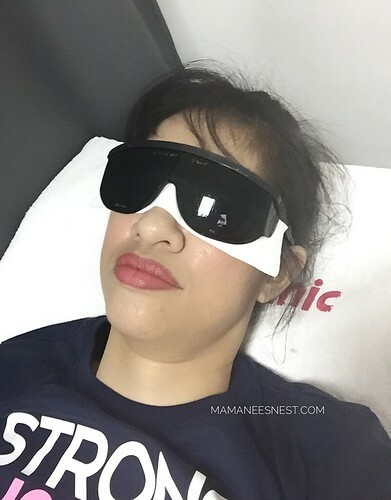 I was sad though since I was not able to complete my treatment since the flashes of the laser light that my eyes could detect (despite the goggles and eye covering) triggered my vertigo. Now, this is a very rare occurrence -unfortunately for me, I am part of that small number of people that get affected. 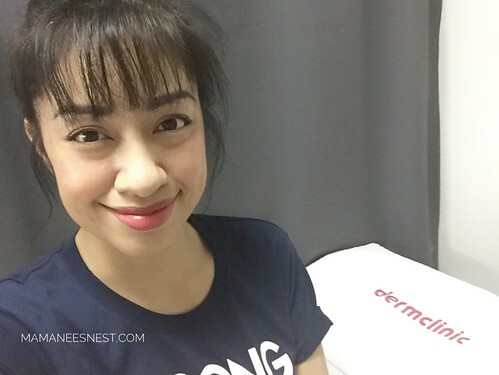 Again, this is not a common outcome and Dermclinic and Carla D. made sure I was at my absolute comfort, as soon as I expressed that I was uncomfortable, she stopped the treatment immediately - offered me to rest and even apologized, despite the fact that she had no fault at all. Update with the condition of my underarms post treatment, I am on my 3rd week, my hair growth has reduced significantly and they feel smooth - so I'll be sure to get my follow up treatment. Follow them also on social media for promo and updates on Facebook, Instagram and Twitter. Thank you again to the staff of Dermclinic Megamall especially to Carol P. and Carol D.!